Since you spend one-third of your life in bed, commit some time to shopping for your new mattress. A little research about the features and benefits available can improve the quality of your sleep for years to come. If you are like most people, you won’t replace your mattress for 7 to 10 years. Therefore you will have to live with your decision – so make a good one! 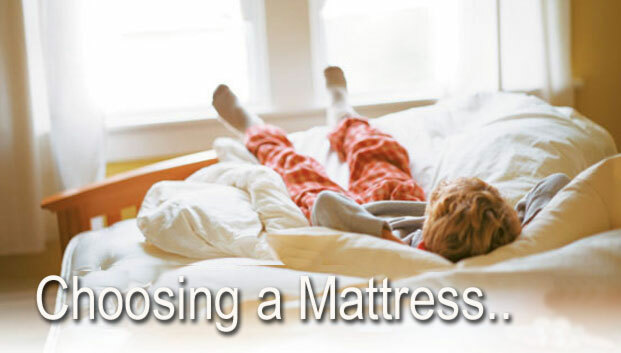 Remember, a good mattress can make a noticeable difference in your health, attitude, and well being. Get Physical and Have Fun! Wear comfortable clothing when going to test mattresses. You’ll be getting on and off of a number of beds. The more comfortable you are when doing so, the better. Shoes that are easy to take off and put on, clothes that are close to what you would sleep in, etc. Don't be embarrassed! This is serious stuff! Imagine yourself asleep! Relax and let your body tell you what's comfortable for you today. Your comfort preferences may have changed since your last mattress purchase, so don’t think that just because you have a firm mattress now, that you still need a firm mattress. Lie on the mattresses you are considering for at least ten minutes, trying different positions — especially the ones you sleep in. It will take a few minutes to really find out if a mattress supports you the way it should. Some people have suggested this rule of thumb: when lying on your back — slide your hand under the small of your back. If it is very easy to do and your shoulders and hips are uncomfortable, the mattress is probably too hard. If there is no space between your back and the bed, it is probably too soft. Roll over — if it is very hard to roll over the bed is probably too soft. Remember to test the mattress on the foundation that it is designed to be on. If you are sharing the bed with someone, both of you should try it at the same time. Roll around. Get on and off. See how much movement you feel because that is what you will feel when your partner is tossing and turning. Does the mattress conform to your spine's natural curve, keep your spine aligned when you are in bed and distribute pressure evenly across your body? Is there edge support around the perimeter of the mattress? This will usually be a heavy gauge border wire that will provide increased comfort and support from edge-to-edge. If the answer to these questions is 'yes' then your mattress will help circulation, decrease disturbance from body movement and enhance the quality of your sleep. Pocket/open coil innerspring mattresses and viscoelastic memory foam mattresses generally do a better job of providing adequate support than other mattress types. Remember, if you are comparing similar size mattresses, more coils of lower gauge (thinner) wire may give better support and last longer than fewer coils with a higher gauge (thicker) wire. Firmness factor, Softness factor, Both or Neither? Unless you've come from another planet, you are limited to three main sleeping positions: on your back, on your stomach, or on your side, though it is common for people to use more than one position during the night. Depending on what position you are sleeping in, different parts of your body will need to be supported. Some say that a "firm" or hard mattress will provide better support. But what really matters is that a mattress distributes pressure evenly across your body thus providing better support. Some experts recommend firm mattresses because back and stomach sleepers will not sag into the surface and will prevent spinal bending that can result in back pain. Side sleepers experience a great deal of pressure from putting the most weight on smaller areas of the body, reducing circulation and causing increased tossing and turning. A softer mattress can help a side sleeper by minimizing pressure in these areas. A recent study of adults with chronic back pain showed that sleeping on a medium firm mattress will create less back pain than on a firm mattress. Queenstreet of Exeter, Devon has over 100 beds & mattresses, of all sizes, in stock for immediate delivery. For more information call 01392 433292 today! Alternatively, visit our website www.queenstreet.co.uk for special offers on our beds & mattresses.